Lough. Registration begins at 8:30 am. Anne Lough is a internationally known traditional musician with over thirty-five years experience in performance and teaching. A native of Springfield, Virginia, Anne has been around music all her life and began playing and singing folk music as a young teen. She has a Music Education Degree from Murray State University, Murray, Kentucky, and a Master of Music Education Degree from Western Carolina University, Cullowhee, NC. Now living in Western North Carolina, she devotes her full time to festivals, workshops, performances and school residencies. 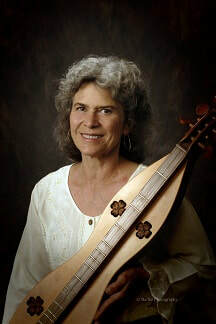 In addition to being a frequent instructor in mountain and hammered dulcimer at the prestigious John C. Campbell Folk School in Brasstown, NC., Anne has taught and performed at numerous other festivals and workshops throughout the country and in Ireland, Scotland, England and Belgium. Equally at home on guitar, autoharp, mountain and hammered dulcimer, Anne's mastery is impressive. Her artistic interpretation, sensitive playing style, versatility and skill as an instructor have earned her national acclaim. Anne is also well known as an instructor and performer of traditional singing, storytelling, folklore, folk dance and the shaped-note tradition, but her repertoire ranges from classical music to old standards, show tunes and sacred music. Anne's music can be heard on a number of recordings, Smoky Mountain educational videos, public radio and a recent PBS Christmas Special. She has also published several collections of arrangements for the mountain and hammered dulcimer. To register, click here or on the Workshop Registration Form tab. There will be a few dulcimers available for beginners. If you have further questions, you may contact Betsy at 803-960-3918 or Loretta at 803-429-1319.